GVS introducing one of the most innovative tape less backup, ability to expand easily with endless storage capacity with 1TB, 2TB and 3TB drives. 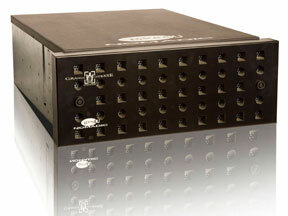 This innovative hot-swap solution designed with all the security and reliability in mind with the most cost effective data backup in market place today, with less than a $0.06/per Gigabit, the Archive Nomadic 4U 60X line deliver the user ability to start at 32TB to 180TB in 4U rack to full rack of over 1.8PB of storage in a 6ft. GVS is introducing one of the most innovative tape-less backup systems with the ability to expand easily and offering endless storage capacity utilizing 1TB, 2TB and 3TB drives. The hot-swap solution is designed with security and reliability in mind as well as cost effectiveness at less than a $0.06/per Gigabit. The Archive Nomadic 4U 60X line delivers users the ability to start at 32TB to 180TB in a 4U rack and expand to a full rack of over 1.8PB of storage in a 6 ft. space. The main consideration of Nomadic 4U 60X product family was the reliability and cost to allow user to adoptee to world of tape less, ability to access and retrive data at speed that was unheard off, as if like the data is local attached to your local SAN or individual machine, without compromise in performance and allowing user to have the chouse and able to easily upgrade without having to really on single source for its media, and able to adote and mixed media sizes from TB, 10TB drive as they get introduce to market place, that is why, GVS has designed the Nomadic 4U 60X product from ground up with single point in mind to allow user to expand with there own drive, without having to relay on us for commodity product. Our technology is based on Open Hardware Design (OHD) so you can upgrade drives on an as-needed basis, pay the current market value for each drive and take advantage of new sizes that are available with the adequate power and cooling you require. GVS is now shipping the Nomadic with 1TB, 2TB, and 3TB per drive and is expecting to support 10TB per drive in the near future. Any drive upgrades can be performed directly by end users. 60 hot-swap drives high-performance dual to quad 8Gb/s fiber channel hardware RAID controller, mini SAS, and iSCSI on desktop space with following Operating Systems tested and supported: Linux, OS X, NetWare, OpenBSD, Solaris, and Windows. The ARC Nomadic 4U 60X allows up to 60 concurrent disk accesses to archive content at the same time. No other archive technology provides the media to seamlessly archive 60xHD content at the same time. This technology introduces a remarkable production ability to capture live event and backup, and view all convert movies, remove scratches, or edit content in a complete shared environment in secure manner, without adding more traffic to your network. Combined 60 SAS/SATA storage drive with Nomadic 4U 60X offers excellent performance, superb integration with a variety of systems, and enables cost effective electronic transfer of high-resolution masters. Beginning with capture – via telecine, direct from digital camera, tape or direct to disk animation – Nomadic 4U 60X technology records an exact copy of the original content. Throughout the post process, from color correction to DDR, editing, effects, audio processing finishing and optional down conversion for distribution, Nomadic 4U 60X can integrate effortless in your production without any down time or network configuration. The Nomadic 4U 60X offers independent digital, format allowing the ability to sync with your SAN and NAS server line to archive over number host interfaces that would best meet your speed and network requirement. audio to video clips recorded at any frame rate. With unlimited virtual channels and independent channel editing capabilities, the Nomadic 4U 60X supports the most rigorous network backup and archive system. Whatever your long term archive requirements, Nomadic 4U 60X offers flexibility, speed, and the highest relaibility, compact, low power, most compact storage media. In addition if your gigabit or fibre network is down you have the ability to access to your entire backup media immediately without having to restore content, all your content remains live, with assigned data base for specific media. Nomadic 4U 60X provides the best platform for cost effective archive solution for any production with high demand secure and easy archive environment.